and Lardworks Fiber & Glass Studio. Meet the gentle alpaca up close. Our educational tours take you from alpaca origins and care to learning how their delightfully soft fiber is processed and used in wearables and art. The tour also includes a visit to Lardworks Glass & Fiber studio gallery/store. This is a private farm! Please respect our privacy and make an appointment before arriving. We do not accept drive ups. If you wish to shop in the Gallery/Farm store and not take a tour, you will still need to make an appointment to do so, see below for contact information. We do not charge a fee per person to visit our farm. We do however appreciate donations or store/gallery shoppers! Our dogs have a job on the farm…besides entertaining our guests. Their job is to keep other canines off our property. Canines are the biggest threat to alpacas as a predator. 2) Fill Out Form at Bottom of this page. ~Please read the tour info below before making an appointment. We are not open in the early mornings, this is chore time. Most appointments are made after lunch between 1 and 3 pm. The number of tours we schedule per week depends solely on our availability that week. There is no set schedule. We do host five Open Farm/Studio events every year. No appointment is needed during these event dates/times, click here to learn more. 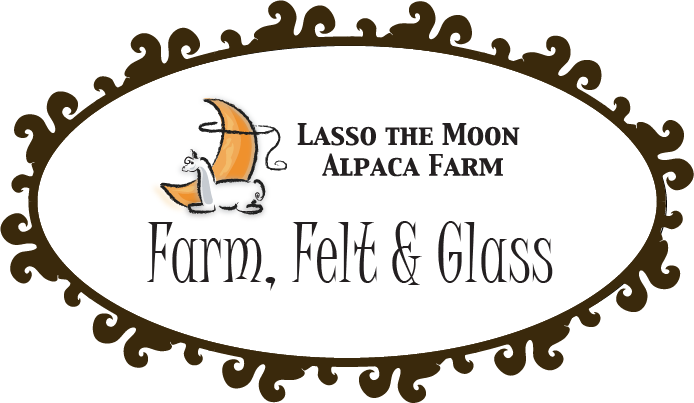 It is our mission to educate our visitors about alpacas and all the uses for their wonderful fiber. We answer a lot of questions and share a lot of information regarding the origin and care of the alpacas as well as how the fiber is used and processed. As a full time fiber artist, we also talk about some fiber arts techniques and view some of our fiber art work in the Studio. We do let folks interact with them (pet them with our assistance) and usually feed them a bit when appropriate. We do our best to be sure everyone has an enjoyable visit, humans and alpacas alike. Animals and small children can be very unpredictable, for this reason we please ask that all toddlers and children under the age of 4 must have a parent within arms reach of the child at all times. Young children under the age of 5, may prefer a petting zoo type facility instead of a working, private farm such as ours…but of course ALL are welcome. Alpacas are sweet, but very shy and don’t like loud noises and fast movement. However, if you are patient they will come up to you and give you a kiss. We do offer occasional private tours to larger groups, for example, the VW Club of Athens, The Young Adult Leadership Group shaperoned by United Community Bank, as well as some smaller groups of home schoolers. There is an age and student to adult ratio requirement for larger private tours. We do not host school bus tours or children’s parties. Due to the stress on the animals brought about by large groups of ‘excited’ young children we do not host school bus tours or childrens parties. This does not apply to individual families visiting the farm, but larger groups where there are more children then adults. We do Not lease our alpacas for birthday parties or wedding events. Would you like to learn how to felt a bar of soap, or make a bird nesting ball? We do offer some shorter, less involved fiber art class. We would start with the educational alpaca tour, then get busy making some fibery fun to take home. Classes can even include a farm to table style lunch for an extra fee. For more information on our “Touch of Fiber Arts, make and take Tours, click here. Not able to make it to one of our Open Farm/Studio Events? to tour the farm/studio on a different date. Please note, just because you pick a date does not mean we are available. We will do our best to work with you to find a date that works for both of us. You will hear back from us within 24 hours.